Best practice product safety labels and signs require complete content. Uniformity between the safety signs and tags in facilities and labels found on products has an important benefit: consistency. When it comes to warnings, consistency breeds familiarity and increased comprehension - part of effective safety communication. Clarion Safety Systems, a leading designer and manufacturer of safety signs and safety labels, has been featured in the latest issue of In Compliance Magazine, a leading source for news, information and resources for electrical engineering professionals. In Compliance delivers the latest news, standards updates, technical explanations and guidance, as a resource for engineers to turn to for education, information and inspiration. Geoffrey Peckham, CEO of Clarion Safety Systems, authored the “On Your Mark” column, published in the magazine’s July 2016 edition. 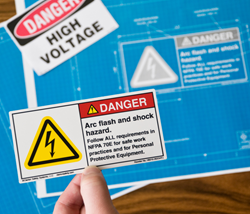 The article focuses on the importance of consistency in the use of symbols and formats for both product safety labels and facility safety signs. “On Your Mark” is a regular column that discusses the latest best practices in labeling and how graphical symbols are used to more effectively convey safety messages. The article is the third piece in a four-part series focusing on current trends in safety symbol design. In October 2013, OSHA incorporated the latest versions of the ANSI Z535 safety sign, tag and color standards into its safety regulations, aligning them with today’s best practices. This change, which allows for consistency in both sign and label formats using the latest standards, is impacting our products and our workplaces, Peckham contends. “The OSHA change allows the safety signs and tags in workplaces to match the ANSI Z535-formatted product safety labels now found on most machinery, component parts, tools, and consumer products that have potential hazards related to their use,” says Peckham. One of the main reasons OSHA made its change to add the newer standards-based safety sign and tag standards to their regulations was so that those responsible for communicating risk could use the more advanced ANSI Z535 warnings technology – a technology that manufacturers have been using for their product safety labels for the past two decades. ANSI Z535 signs, tags and labels most often give viewers a significantly higher level of content. They do this by including symbols, words, translated text, and well-defined color-coded severity level panels to accurately communicate a risk-reduction message. “The goal of every safety sign and label system is to provide accurate, concise information that enables viewers to understand risks and take actions to avoid harm. Such systems of risk communication are an essential part of both a product manufacturer’s safety label program and a facility owner’s occupational health and safety management system. Both types of safety communication have, as their common objective, the most valuable goal: to make the world a safer place,” says Peckham. Peckham’s credentials include currently serving as chair of both the ANSI Z535 Committee for Safety Signs and Colors and the U.S. Technical Advisory Group to ISO Technical Committee 145 – Graphical Symbols. He has also been selected as a member of the U.S. TAG to ISO/PC 283, an ISO committee writing a new standard, ISO 45001 Occupational Health and Safety Management Systems, which will, when finished, define global best practices for workplace safety. In addition, he is an active member of many industry-specific standards committees related to safety signs and labels for buildings, ships, machinery and products.